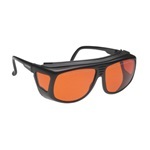 Orange colored ARG eye protection that fits over glasses or stands alone. Has side-shields for wide field of view. Size: universal small. Measures 140mm x 132mm x 50mm. Manufactured by Noir. Comes as singles. 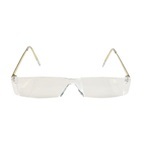 Lucite Economy Readers with clear plastic lenses and silver temples. 2.50 diopters. Eye size: 45mm, bridge size: 15mm. Manufactured by Yorktown Optical. Comes as singles. 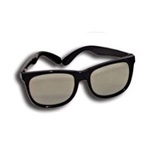 Adult size black framed glasses that are replacement polarized stereopsis viewers. Manufactured by Bernell. Comes as singles. 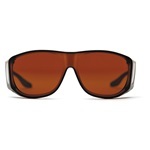 Amber colored post-cataract eye protection that fits over small, medium and large sized eyeglasses suitable for driving. 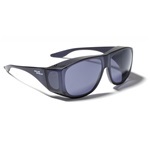 Light frame with 100% UV protection, polycarbonate lenses. Comes in black pouch. 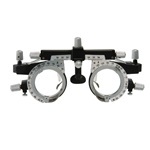 Size Large: Fits over Rx frames not exceeding 5-1/2" W x 1-7/8" H. Manufactured by Yorktown Optical. Comes as singles. Frame holds up to 4 lenses on each side. 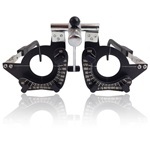 Has adjustable frame temples, PD, nose pad, and cylindrical and prismatic axis. PD ranges from 48mm-80mm. Manufactured by Luxvision. Comes as singles.